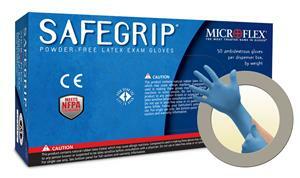 Safegrip Powder-Free Latex Gloves Offers increased protection in hazardous environments. This powder-free latex glove has an extended, beaded cuff for greater protection over the wrist and arm. This blue latex glove provides greater thickness averaging 16 mils at the finger tips - more than 5x the ASTM standard. Features high tensile strength for latex glove durability, and a low modules for enhanced tactile sensitivity. * Latex Glove Finger Thickness (mils): 16.5 + 0.8 / - 1. THICK BLUE LATEX GLOVES WITH EXTENDED CUFF.